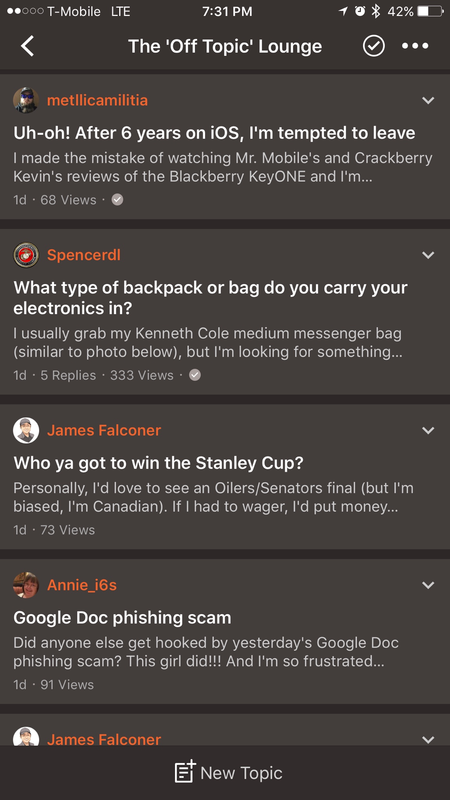 Something I noticed a long time ago and never asked, why doesn't the Off-Topic Discussion show up under the unread or participated tabs in Tapatalk? You either have to subscribe to a thread or continuously browse to Off-Topic in forums to see if any replies came in, or new posts. Hmm. I see off topic threads in Unread and Participated all the time. Interesting. I'm not subscribed to anything in the Off-Topic section, and yet, the participated and unread sections display for me via Tapatalk. Things like Politics show up for me as well, however, nothing in The "Off-Topic" Lounge shows up for me unless I subscribe or go directly there through the forums tab. I don't know what to tell, my friend. Everything in the "Off-Topic" Lounge displays for me. Have you reported it via Trello? I have not, but I can, these threads here, a couple of which were started by James that I never knew about because they don't populate my unread feed or participated. Oh, i see what you're saying, and you're right. What's strange is that a good deal of the topics therein are visible to "me" in the Unread, New Posts, and Participated tabs, but some are not. Hmmm. I know a while back, changes were made in regard to the off-topic lounge and I wonder if what we're experiencing is a side-effect of it. Anyway, go ahead an report it via Trello, if you haven't already, and I'll do what I can from my end. That is weird, I'm trying to remember if the Off-Topic Lounge ever populated Unread or Participated for me. If it did it was some time ago. I've never used Trello before. How do you report anything? I created an account, but don't know what to do next. Just checked and you're already added to the group in Trello. Instructions are under the card titled "How this board works". I added him to the group after reading his post earlier this morning. My communication with him since then has been via PM. manual sorting of playlists in Apple Music on iPhone and iPad?